Decorate your cut-out holiday shape cookies this year! This easy-to-make dough can be rolled out immediately (no need to chill it) and cut into your favorite holiday shapes. Margarine can be used instead of butter for parve cookies. Use non-stick cooking spray and sanding sugar to make colorful and fun designs. Happy Hanukkah! Mix margarine (or butter) and sugar until smooth. In a separate bowl, mix flour with baking powder. Slowly add flour mixture to the dough until just blended. Divide dough into 2 balls. Do not refrigerate the dough. Flour rolling pin, rolling surface, and cookie cutters. Roll out dough until 1/8 inch thick. Cut into shapes. Use a spatula to place cut-out shapes onto an ungreased cookie sheet. 9. Continue rolling and cutting cookies until the dough all the dough is used. Re-flour surface, rolling pin and cookie cutters as needed. 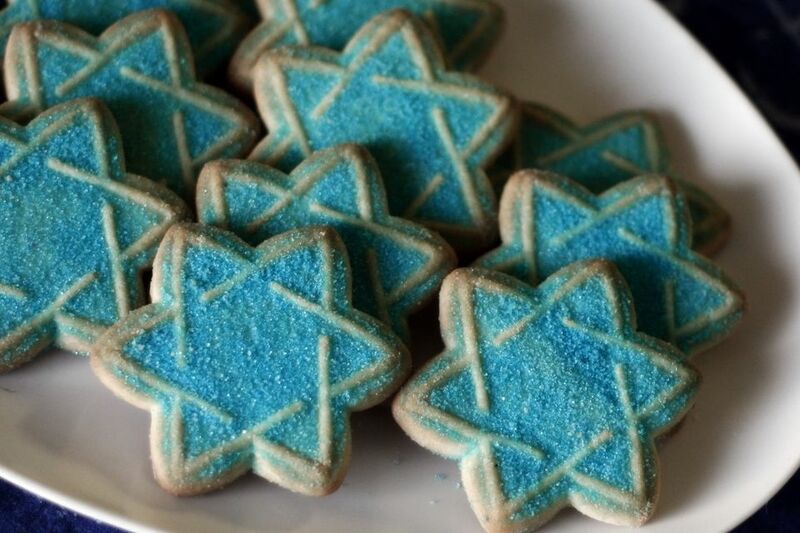 To decorate the cookies, spray the tops of the cookies with non-stick cooking spray. Place a spatula or other kitchen tool with interesting lines or holes on top of the sprayed cookie. Sprinkle with sanding sugar. Carefully lift spatula. Bake at 400 degrees F for 6 to 8 minutes or until lightly browned.